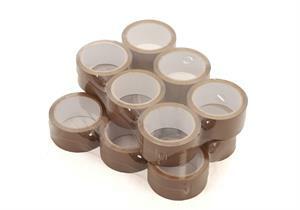 This is an exception tape and the #1 tape adhesive preferred by professional moving companies and packing companies. Great resale value at this price. This item is sold by the case with 36 rolls. A hot melt adhesive is a higher grade to an acrylic adhesive. The dream tape for all movers and packing companies. PALLET ORDERS: There are 108 cases to a pallet. If you want to order a pallet, select the price for 108+ cases. Then in your check out, select warehouse pickup. From there, we can negotiate fees for out of area freight or local delivery. Buying 108 cases, understand you are buying a full pallet. That's 3,888 rolls of tape. You can buy in multiple case volume, or in 1, 2 and 3 pallet quantities. Take advantage of the pallet rate discounts.